Cilla worked as a cloakroom attendant at the legendary 'Cavern' in Liverpool during its hey day in 1963. Occasionally she would get the chance to sing with the groups and was eventually 'discovered' by Beatles entrepreneur Brian Epstein. She was placed under the same EMI production team as the Fab four and under George Martin's guidance managed to produce a striking version of Burt Bacharach's 'Anyone Who Had A Heart'. The same confident, strident vocalisation that she created on this disc would carry her on to make a series of individual sounding pop records during the next several years. 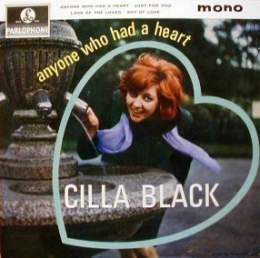 The EP shown on the left was Cilla's first release on the format and as its title suggests it features her first really great hit. In fact, it contains both sides of her first two singles releases. Despite this, it sold well and is one of the easier of Cilla's extended play records to find. Although her successful rivals would generally continue with their life of rock and pop, Cilla decoupled herself from the music but still managed to gain enough live TV work to stay in the public eye and become a 'personality' and family entertainer. Her new persona is now quite apart from her earlier musical career, and she has exploited her personal idiosyncrasies to advantage. In fact, Cilla's current TV image is so different from her years as a top pop star that it is easy to forget her astonishing and enviable run of hit 45rpm recordings. Parlophone GEP8967 1967 "Time For Cilla"